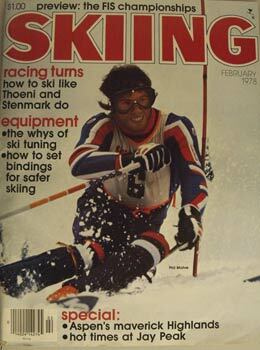 Originally published March/April, 2005 issue of SKI Magazine. On a recent flight to Denver, I sat next to a young lady who told me she was heading to the mountains. So after being served the standard miniature airline meal of experimental potato chips and a soda, I attempted to strike up a conversation with her about my favorite sport. She instantly acted like she didn&apos;t understand a word I was saying, so I offered her my years of experience as a foreign language expert and a world-traveling snow-slider to help her learn the definitions of some of the important words in the ski world. "You can&apos;t play the game until you learn the lingo. Here&apos;s the start." When two ski resorts with three years of bad snow climb onto the same toboggan to ride downhill on what&apos;s left of their financial statements. A quarter-million-dollar device that flattens all of the bumps in the snow because anyone over the age of 40 would have to quit skiing if it had not been invented. A very expensive gizmo that sprays small drops of water onto rocks and stumps so when the temperature is below freezing the water slowly coagulates into frozen, icy masses the size of subcompact cars that the skiing press calls moguls. An optimistic hypothesis of potential snow conditions by the assistant to the assistant marketing director-who is looking for a higher-paying job. Something that cost DuPont about $14 billion in research and development funds so the company can duplicate the inner feathers of Chinese ducks-which cost about 45 cents each. Something you pay as much as $75 per day to stand in and freeze, unless you pay an extra $420 per day for a private instructor so you don&apos;t have to stand in one and freeze. A very expensive, noisy and scary way to become the most listened-to person at cocktail parties. Something that is added to a pair of skis to substantially raise the price. The mystical and hypothetical amount that is subtracted from the retail price of any ski product after the normal markup has been doubled. A $4 million device that lets you float through the air at an incredibly high speed and deposits more skiers per hour at the top of the mountain than the snow conditions can handle. You will usually ride up a quad with three people who are busy talking on their cell phones. A commodity that requires vast amounts of coal to generate electricity to expensively convert water to white stuff on the side of a hill where it covers brown stuff called rocks. Some of the brown stuff usually sticks up through the white stuff. The company that you found online that books you into the wrong room, at the wrong end of town, at the wrong week in the season, at the wrong price, when the snow is thin and there&apos;s no storm in sight. By the time I got this far, my seatmate on the airplane cooly handed me her business card-and told me that PSIA stands for Professional Ski Instructors of America.